Bella cromolitografia del 1843 tratta dalla celebre opera di botanica Flora der Schweiz di Heinrich Romer sulla flora della Svizzera. In buone condizioni, qualche fioritura. Segni di colla al verso. TECNICA: Cromolitografia DIMENSIONI FOGLIO: cm 18x11 DIMENSIONI INCISIONE: cm 15,5x9,5 EPOCA: 1843 CONDIZIONI: Buone condizioni, qualche fioritura. Resto di colla al verso.Beautiful chromolythography of 1843 taken form the famous work of botany Flora der Schweiz by Heinrich Romer about flowers of Switzerland. In good conditions, some foxings.Glue signs in the verso of page. 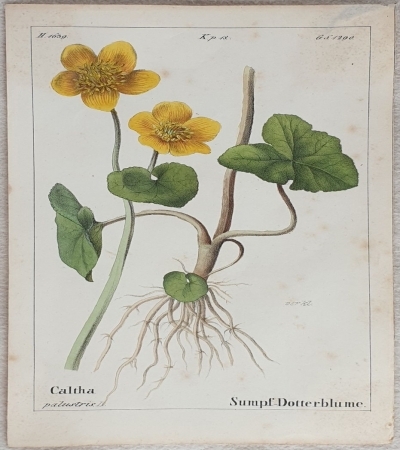 Caltha palustris TECHNIQUE: Lytography PAGE SIZE: cm 18x11 PRINT'S SIZE: cm 15,5x9,5 PERIOD: 1843 CONDITION: good conditions with some foxings. Little tears in the lower edge. Glue signs in the verso of page.